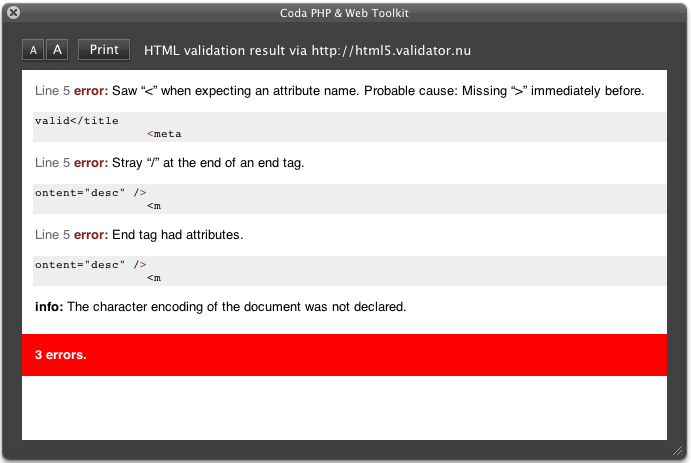 A Coda plugin aimed at PHP & Web development – not in active development. All features use the editor buffer (no need to save first) – Works with local and remote files – Written in Cocoa/ObjC. HTML tidy now configurable (in the Preferences) ! CSS tidy now configurable (in the Preferences) ! First have a look here » – if that doesn’t help, please write a comment below. Just leave a comment or donate (via paypal) ». For German users I can only recommend all-inkl.com (Partnerlink). v.4.1 CSS minification shouldn’t quote @keyframes name. Trying to figure out how to remove ’empty’ line spaces for HTML tidy. Can this be done? I went and found the plugin but not sure where in the contents folder to modify. Is there a formatter for mixed HTML/PHP? I currently don’t know of one – except of course software like phpstorm. Am I just that bad at Coda 2? use Text -> Wrap in Tag. Hello, it very nice plugin. good job. I’m using Symfony2 and I want to know if it is possible to configure and tidy html.twig tags. because till now when i try to tidy html, that break or remove tags and Blocks. I think also i will be nice if your plugin can become open source, and by this way people can contribute for it developpement. No, that’s not possible with HTML tidy, the software I use to format HTML. About open source: Yes, that’s my plan anyway. Thanks, this really helps my workflow! I noticed that when I ran HTML –> Tidy HTML it deleted all of my icon elements (i) in HTML. For example, was deleted, had about 5 i elements that were missing. Thanks for your hard work! You can use the 4.2beta and select the html5 tidy in the preferences – then i-tags shouldn’t be removed anymore. (In the prior version of html tidy you should use em-tags instead). Is there a way to set custom JSHint options for example the unused warning is kind of annoying, because they are being used. I believe the beta 4.2 version may have fixed this, can you update the changelog per chance? 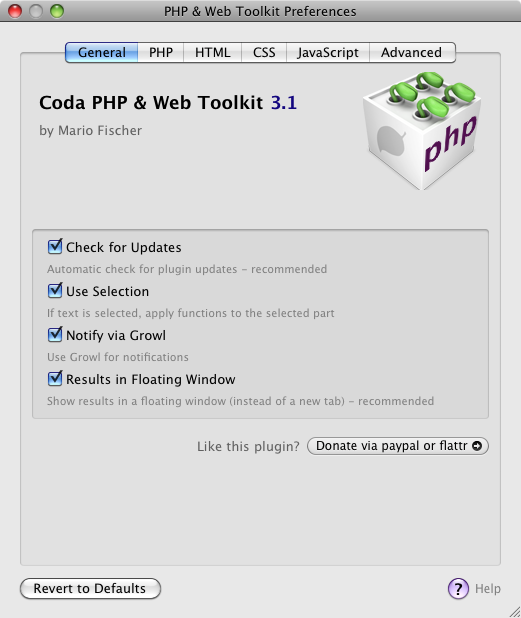 Hi, I have upgraded to the new Growl (V2.1.3) from the AppStore and tried to used it the Coda PHP & Web Toolkit (V4.1). Unfortunately, it doesn’t seem to find Growl and continues to use the standard notification dialogs. So the question is now, how can I activate Growl? Usually you just check “Notify via Growl” on the General section of the plugin preferences, but it might be incompatible with the new Growl version. First thing: Try the latest 4.2 beta version of the plugin. The “everything fine” dialogs should disappear by themselves, just tested it – but in case of problems the error messages (of course) don’t disappear by themselves. So in my opinion this behaviour is correct, which behaviour would you expect in case of errors? I’ve tried the beta, but there the standard notification are also used, regardless of the “Notify via Growl” setting. In case of an new error I would expect that any previous notifications should be closed. The way it is now, all previous notification stay open, but their contents is gone. This doesn’t seem to make sense. Another thing I noticed: when saving multiple files with Command-Option-S, I wouldn’t be able to find out which file created error messages, because the filename doesn’t show in the notification. The filename is a good idea for the error window, noted. Now I see your problem, the “old” dialogs just hang around and are empty – yes that’s a bug. Is on the list, thx! Hi – Love the plugin and it saves me heaps of time! One annoying aspect I find is that when using the tidy functions there is no option to use tabs instead of spaces. I love the tidy functions and it is one of the main things I use this plugin for, but I have to do a find/replace to get all my tabs back in there. I second this request, only thing missing from this awesome plugin. this feature is with the currently included html tidy not possible (from the documentation: “Tidy never outputs tabs.”), but it might be there’s a new html5-tidy which supports this feature. I’ll have a look. my script no longer installs becasue of updated php version, can i get your direct email so that i can send screen shots and the small script. that’s on my todo-list but it might take some time until I find the time for an update. If you know PHP you can modify the file “csstidy.php” yourself (if you right click on (your home folder)/Library/Application Support/Coda 2/Plug-Ins/PhpPlugin.codaplugin, choose “show contents” and go to “Contents/Resources”). Starting from line 642 are the rules for the CSS-Tidy modes. So great!! Thanks a lot! it seems the tidy executable makes problems. 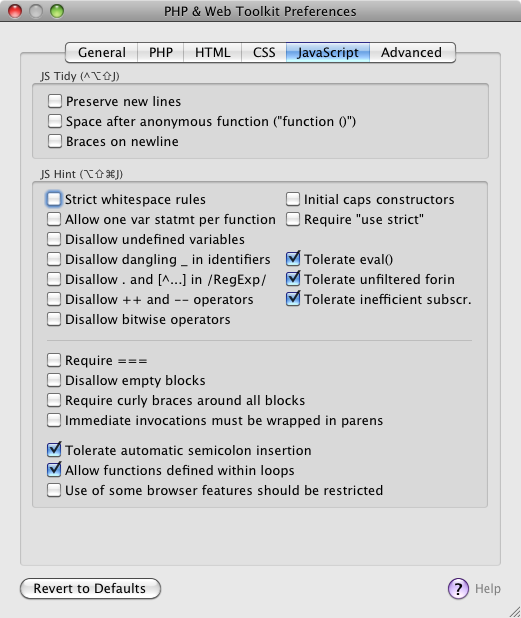 As first idea please try “Use HTML5 compatible Tidy” in the settings (or disabled it, if it was already enabled). If that doesn’t help: Which Mac and which OS X version do you have? It should be handy to not remove css comments on wordpress because it is used by the CMS for internal use. This wonderful plugin has change my life. I love the tidy and minify for code. Many many thanks for plugin development and great supporting. This is a great plugin for Coda! I have a question with HTML tidy. I’m trying to tidy a section of HTML which is used as a template. It doesn’t need tags. However, the plugin kept adding all these tags which is quite annoying. I have read the whole option reference and can’t find one option which can turn it off. Pls advise if it is possible to turn the “Automatic HTML Head Adding” off. The message seems striped my < bracket. I mean the html, title, head, body tag. therefore just use the “body only” preset, that’s exactly for this case. Great plugin to find PHP syntax errors – you saved me hours! I’m having a minor issue with the plugin, maybe a bug? All the commands work except for “Tidy HTML”. it seems the plugin doesn’t find (or can’t access) the included HTML tidy executable. Did you check the hints here http://www.chipwreck.de/blog/software/coda-php/help/#quick ? If that doesn’t help, write me an email and we’ll sort it out.. Same – did you get this working? The JS Minify function is putting a lot of things in new line. Is there any option or way it could puts everything in one line? The way actual minify should work? Also, is there a way to maintain a file.min.js for the minified version (published version) and file.js for development. This is the way I think it should be… Don’t you think? the JSMin implementation is not very flexible. It’s a port of the Douglas Crockford JS Minify, but maybe there are better solutions now. For the next version I’ll have a look. About the .js/.min.js: Of course this would be the best practice. Currently you can keep the .js-version locally and publish the minified version automatically (see plugin settings). If I find some time I might include another option to automatically save a “*.min.js”-file next to the original file. This is what I was looking for a long time ago. Only one question. Is it possible to have a tab indent code format instant of a 4 space indent? ditto; need this feature if i’m going to use this and still work with other people. You can switch this per file in the Coda settings or with the gear-icon at the bottom. All my scripts now throw at least two warnings because of quotmark and other modern flags. Chances are quite good :) I suppose in the next days I’ll find the time to update JSHint and the plugin. 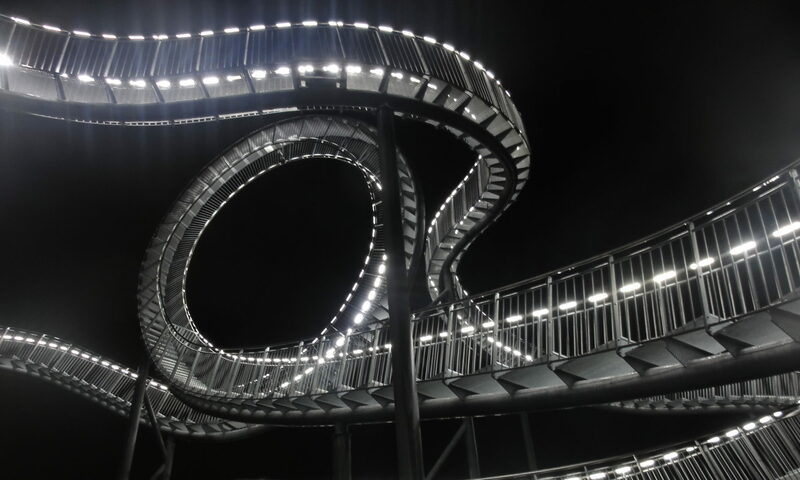 Have a look at the beta version above! 1. Why HTML head and body tags added each time I want to Tidy-up only a body code? I know I can use the “body only (experimental), but it’s still experimental and deletes other code parts such as PHP includes outside of the HTML tags. 2. Input tags such as Label, Textarea and Inputs are Tidy-up funny. Textarea breaks in the middle if you use a placeholder, the closing tag indents to the far left not under the opening tag. 3. Label and input tags follow each other rather then wrap as separate tags. The thing is I use HTML tidy and can’t simply add features or modify its inner workings. You can play around with the settings (see documentation on the plugin settings page), that should help. About “body only”: I’ll remove that “experimental” tag :) But php-statements should be left in the code, at least if you use the complete form for php-tags (that is: ?php … ?, with the brackets of course). Almost all front-end code is build on includes and parts not full HTML pages with body and head tags. having those added each time I try to tidy part of my code is annoying and time consuming. Of course, same goes for most complex web projects. I have PHP & Web Toolkit for Coda 2 and lately I’ve noticed that the CSS Minify and CSS Tidy features are resulting on the same thing (minified CSS). Are you aware of this issue? Any help or solutions for this? That depends on the CSS tidy configuration in the plugin settings. If you choose “highest compression” it is quite the same, but not for the other settings.. I can confirm that the HTML Tidy option, using the Body Only configuration does all kinds of different things to embeded php tags. Some it throws away completely, some it converts to <?php and some it leaves alone. Is there a configuration option (Custom, perhaps?) that simply indents the HTML nicely and doesn’t add, change or delete anything? Hi there, thanks for this useful coda plugin! I got an issue with the HTML tidy function: i set up for the BODY ONLY tidy mode and aN HTML tag like this “i” “/i” disappear after the script command. I flagged HTML5 compatible compatible tidy but unfortunately nothing is changed. Have you any suggestion to fix it? Hey how to show you the html tag? the “i”-tag (just don’t use the brackets to show tags here) is deprecated therefore considered invalid. Use “em” “/em” instead. I really wish the Tidy HTML command would put comments on a separate line. This plugin would be perfect if it did. As it is now, I have to go back in and move all my comments. Is there a setting I’m missing? I’m afraid that’s a limitation of HTML tidy, so you might look on their website if the feature is maybe planned. Great plug-in. 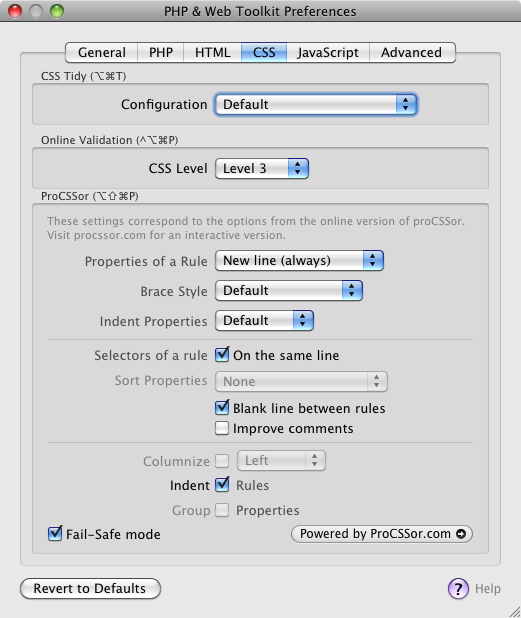 Could it be extended for .scss validation? I don’t think I’ll find the time soon (and have no idea if there is a free and compatible validation tool)..
Hi, thanks for a great plugin. I do have a problem using PHP tidy code, on just a selection. It works great if I do not tick selection. Then it does the whole file. But when I tick to just apply to selection, nothing happens when I try to use it. It does say that it worked, but it doesn’t. Tried from both top menu and right-click menu. Advice? Probably a problem with the selected code, try again with other parts and check if that works..
Great plugin, I have the problem where bootstrap / font-awesome / icomoon etc all use empty tags as placeholders for icons / glyphs, and can’t find a setting that leaves them alone (custom doesn’t seem to have that option). Anything you could do to help exclude certain empty tags (or tags that are empty but have an attribute) in a future version would be appreciated! You could try to use “new-empty-tags” as custom config option, but I’m not sure if the included version of HTML Tidy already supports this option – but in the future I’ll surely update HTML tidy so that new-empty-tags will be supported. I’d like this feature too, could you explain more about how to use ‘new-empty-tags’ to accomplish this? It would be nice to have a php version option so that specific php language features can be tested, for example, the short array syntax “” in php 5.4. I would also be nice if the plugin supported the short array syntax. the plugin calls the installed php interpreter to check the syntax, so if you have php 5.4 installed (via MacPorts for example) you can set the php binary to use in the plugin options (like /opt/local/bin/php i.e. ).